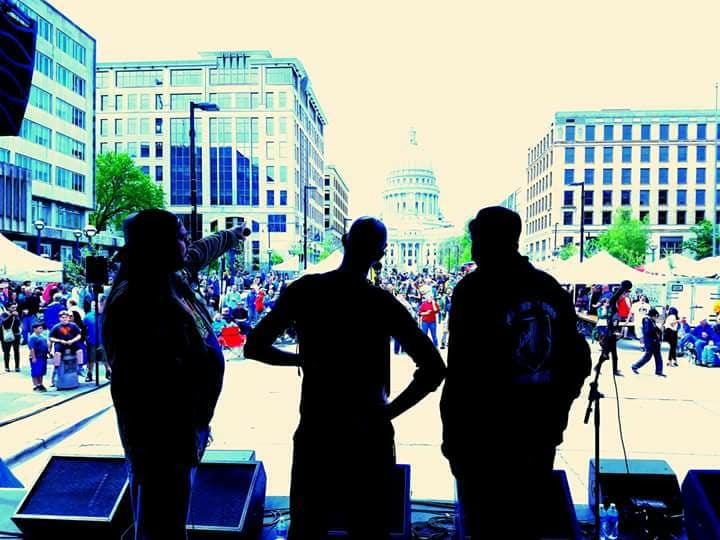 WORT FM Block Party on May 20th 2018 photo courtesy of WORT FM. SO I realized we’ve been so busy with EVERYTHING that none of us have had time to jot anything down in the old blog section. Quickly I will try to recap some of what has been going on and enlighten you further on coming events as relates to your favorite #PolkaHipHop band! We played our first ever West Allis show back in February at Westallion Brewery where the Peanut Butter Porter is lights out! And I’m not a guy that often goes in for sweet craft beers. They also had a fine Scottish Ale and whole bunch more great things to try, they change up their brews on a seasonal basis so it is with a good deal of delight that we are returning there at the end of June! We had a great time playing out in April at The Red Dot opening for our friends Denku and Big Lo! These guys are touring artists and established in every sense of the word. And it was awesome to see an audience full of friends there on a Tuesday night even! Then we broke ground playing the Light Lounge in South Milwaukee and debuted our newest song The Black Hand! That’s right, we haven’t been taking it easy we have been toiling over an EP that, fingers crossed, will also include radio edits of songs from The Great War! The Black Hand even made its way onto the FM dial in Madison at WORT FM where in the lead up to one of our biggest shows yet WORT gave some spins to a few of our songs, published a flattering article about us, and our good friend Helena White used a couple of our tunes off The Great War as jumping off points for a couple history lessons about The Rattlers and Jim Europe! She also has a really wonderful series called My Grandfather’s War Diary about her grandfather’s service during the Great War. The Madison connection went next level for us as first our friends The Periodicals came by on a Thursday night for a memorable Milwaukee debut that we were honored to share the bill with at Sabbatic. Tommy Antonic and Mitch Shiner came through in a big way with a week’s notice to open with all the skill and showmanship of two of the best young jazz musicians in the city! 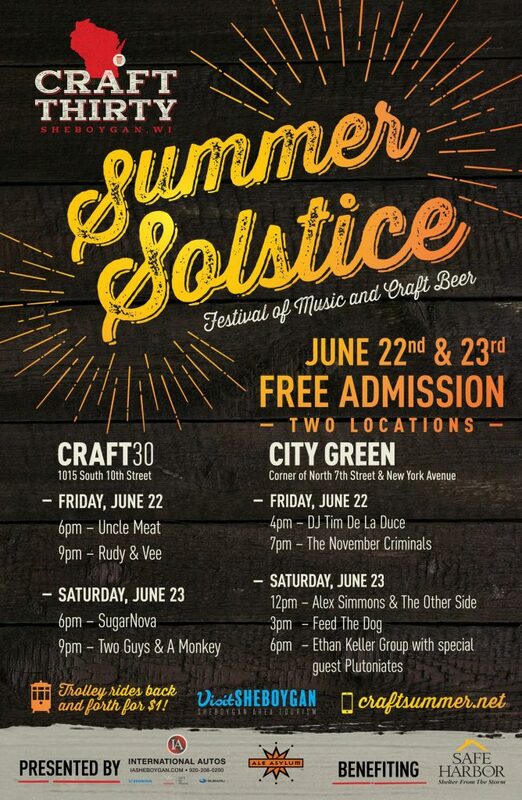 Tremendous line up for the Craft 30 Summer Solstice festival! BUT IT IS ONLY GETTING STARTED! Friday June 22nd it will officially be summer. Craft30 in Sheboygan has organized a party that promises be a highlight of anyone’s summer! They are doing it big with two stages and free admission and some of the finest craft brews in Wisconsin (and therefore the world!) And during the lead up we’ve been getting spins on 96.9 Fox courtesy of Fox Homegrown! Getting there isn’t a problem for Milwaukee folks as it just a short jaunt up I-43 and there are plenty of hotels and campgrounds in case you haven’t selected a Designated Driver! We however won’t be able to hang out too long as we are immediately in Racine the next night at McAuliffe’s Pub with the insanely talented Andrew David Weber (of Whiskey of The Damned)! 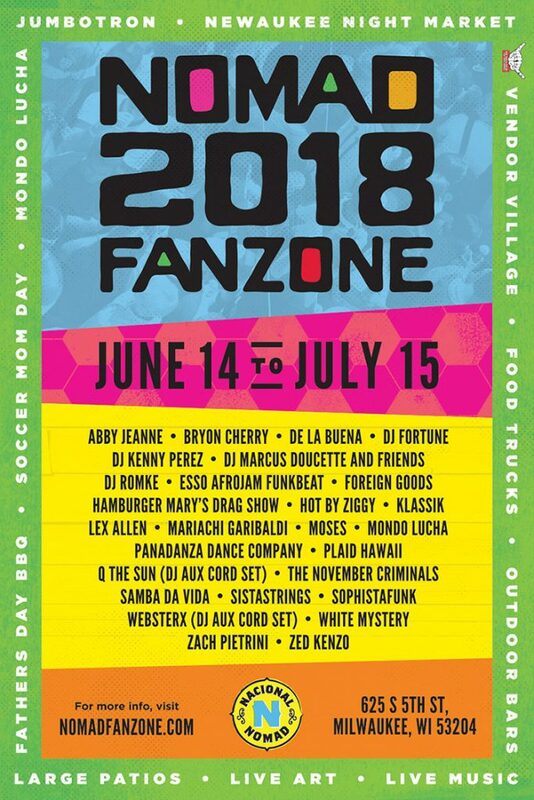 The following weekend we will be part of the Nomad Nacional’s World Cup Fanzone on the 29th of June followed by a return to Westallion Brewery on June 3oth. The show at Nomad is particularly exciting as the fan zone activities the night we play also include the Newaukee Night Market and rumor has it we will have some new shirts along with us by then! If we can take a moment to look at that line up…! What an honor to be listed on a showcase with so many great Milwaukee talents and we are blessed to call many of them friends! There’s no matches on the day we play so we aren’t sure what countries to represent. But we will do our best to bring them all together that night! Hopefully we even get a few folks to follow us to West Allis the next night! Is a 3 day weekend! Friday we are back in West Allis at McCarty Park for the Traveling Beer Garden on July 6th, then on the 7th we are Madison with our friends from the Milwaukee Polka Riot Forro Fo Sho along with Swill at Bos Meadery! Then on the 8th we closed down the Rebel Stage at Summerfest at 8pm! We’ll take a breather and be back in full force in late July for Brady Street Fest! 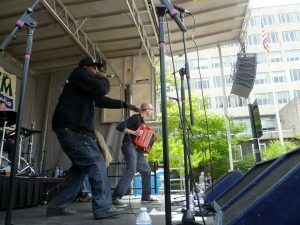 Look for us to be handing out flyers for this year’s Polka Riot! Hope to see you!